The latest issue of The Overclocker magazine is out!!! This is a special edition with a 22 page in depth look into motherboards power circuitry design, performance and efficiency with Gigabyte overall outshining some admirable competition in power efficiency and overclocking performance. Excellent read for all you hardware enthusiasts. "Gigabyte puts “durable” in the name of the motherboard and has designed its systems for higher efficiency to keep temperatures down. 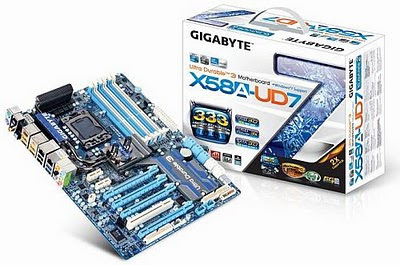 At 24 phases, the Gigabyte EX58A-UD7 had the highest efficiency at overclocked current levels of 100A and above"
“The better performing boards, the Gigabyte EX58A-UD7, EVGA Classiﬁed 760 and ASUS II Rampage Extreme were more stable when overclocking, allowing for higher speeds.